Coming Soon: Our Third Little Reader! I recently made a list of all the words I have heard Bo Peep (18 mos.) say and was surprised to come up with nearly 60. She's very quiet, and she has a very talkative sister, so it was hard to tell without explicitly counting how much she was really talking. I was surprised to realize how much she has picked up, especially in the past few weeks. On the list I made were the words bear and bus, two of her favorite words, which match up with her current favorite books: Brown Bear, Brown Bear, What Do You See? and The Bus For Us by Suzanne Bloom. After two times in a row through The Bus For Us the other day, Bo Peep took the book and began flipping through it, repeating lines from the book that she remembered. She also identifies Brown Bear by name, but it sounds more like "bun bear." I'm not sure what fuels her interest in bears, but we do take the bus once a week, and she loves it, so it doesn't surprise me that she wants to read about it. In addition to reading lots of fiction (especially Miss Nelson Has a Field Day, The House on East 88th Street, and The Hotel Cat), I have been working on introducing more and more nonfiction to Miss Muffet (3 years, 4 months). We're not doing a lot of formal homeschooling at this stage, since she is just three, but I have found that she has a strong interest in science, so I've been reading her some basic science books. We have enjoyed a few of the Let's Read and Find Out About Science titles, our copies of which are older and have the original illustrations. This month, we read Hot as an Iceberg, which taught her the word "molecule"and inspired us to try a few of the experiments described in the text. We're also really enjoying some vintage animal books by Alice Goudey. We've read Here Come the Elephants and Here Come the Seals so far, and we plan to read Here Come the Beavers next. I'll be reviewing these books in their own post because they're so well-done and they deserve a full review, so I'll save most of my comments. I will say, though, that Miss Muffet seems to comprehend these texts better than a lot of fictional stories, and that she asked me find the locations of each animal's home on our globe. I also find the stories completely engaging myself, and I have discovered things about these animals that I have never heard before. 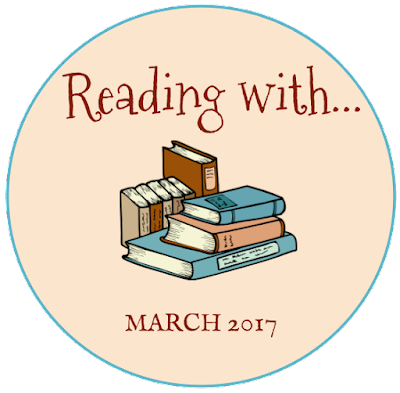 We received a few review copies with March and April publication dates. 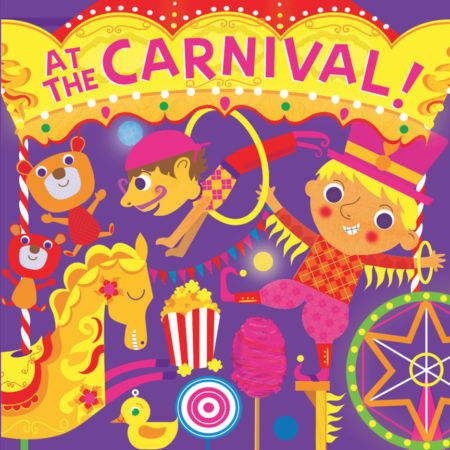 At the Carnival and Bright Lights, Bright City are both board books from the Fluorescent Pop! 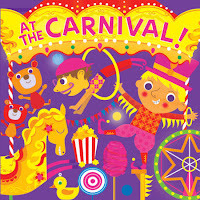 series published by Little Bee Books, which are illustrated with fluorescent colors. The text in both is not very exciting, but the illustrations definitely stand out. I don't read them aloud much, but when I need to put Bo Peep in a playpen for a few minutes, I can sometimes get her to look through these books instead of just throwing things until I come back to get her. I plan to hang onto them because I think the high-contrast colors will appeal greatly to an infant, and we'll have one of those soon enough! Peachtree Publishers sent me an F&G of Fantastic Flowers and Miss Muffet and I pored over it at the dining room table. 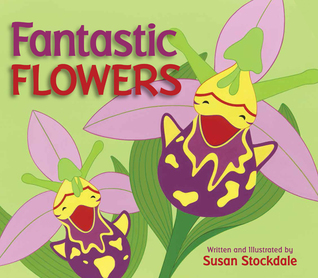 The book is all about flowers that resemble people, animals, and objects, and like Spectacular Spots, which we also love, it has smooth rhyming text and bold, colorful, and very eye catching illustrations. There is also some great back matter that shows what the flowers look like in real life and gives all their names. The author is local to us, and I believe she will be at the Gaithersburg Book Festival this year, so I'm hoping I might be able to take Miss Muffet to see her presentation. Since she is enjoying nonfiction so much right now, Susan Stockdale seems like the perfect author for her. Mrs. McBee Leaves Room 3 arrived with Fantastic Flowers and I did not care for it at all. It's the story of a teacher and her students packing up her classroom on her last day before she leaves the school. I had a hard time buying that kids were helping the teacher carry boxes, or that she had left all of the packing until the last day of school. I also didn't understand why the kids were upset. They wouldn't be coming back to Mrs. McBee's class next year no matter what, so it didn't make sense to me that they were anymore sad about her leaving the school than they would be about the year simply ending. It struck me as a book that adults will want to read to kids but that will not feel relevant to the kids themselves. I think of it as Because of Mr. Terupt for the early elementary years. I didn't bother to read it to Miss Muffet. 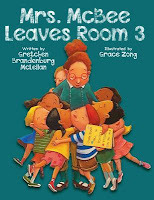 We do read books about school even though she will be homeschooled, but this one just didn't feel worth it. I'm so thrilled to have found you through Amy's Read Aloud Roundup. Your little ones are just ahead of mine (Tirzah Mae is 2.5 and Louis is 9 months), so I'm sure I'll be able to use lots of your recommendations. I've been reading a few school-themed picture books (to myself) as several were recommended in Anita Silvey's 100 Best Books for Children - however, for this formerly-homeschooled-student-who-wants-to-homeschool-her-own-children those stories fell flat. I doubt I'll be sharing them with my children.